Roseanne Barr not only fumbled the ball yesterday, she handed it over to the other team. The top-rated “Roseanne” was quickly canceled after its star stupidly tweeted a racist comparison between former Barack Obama advisor Valerie Jarrett and an ape. Roseanne was a stand-up comic back when a joke like that might have flown, but she still should have known better. She apologized, but it was far too late at that point and ABC ended the show. 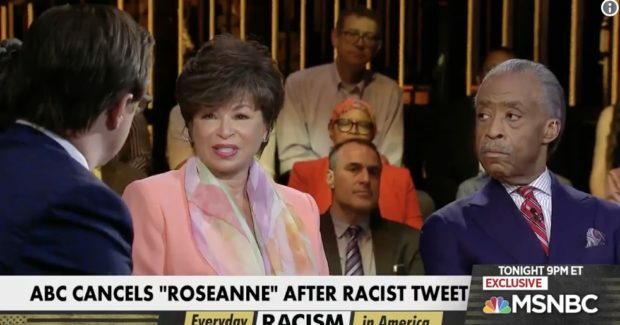 For her part, Jarrett took part in an MSNBC “special” called “Everyday Racism in America,” and chose that opportunity to blame the entire affair on Donald Trump because she is a political hack. In addition to blaming Trump, Jarrett blamed all of America for the “culture of racism” and “rigged system” on which the country was allegedly founded. She did this while sitting next to MSNBC employee Al Sharpton, who pushed a false hate crime accusation, but is now somehow a major news network’s arbiter of what is and isn’t racist. Jarrett was also sitting next to Joy Reid who, it was recently discovered, has a history of homophobic slurs but was able to skirt them by pretending she had no memory of writing those things. Maybe Roseanne should have said “I genuinely do not believe I wrote those hateful things because they are completely alien to me,” like Reid did to get out of being labeled a bigot. It worked for Reid. CNN is very worried about President Trump and “love of conspiracy theories.” Maggie Haberman, a New York Times reporter and an analyst for CNN, thinks the president talking about his campaign being spied on (a story the Times helped break but now denies) is leading to “Putting A Stamp Of Legitimacy” on conspiracy theories. But CNN and the Times embrace the biggest conspiracy theory around — that the Trump campaign colluded with Russians to influence the 2016 election. Haberman seems unconcerned about that conspiracy theory being spread and legitimized. In the same interview, Haberman and host Alisyn Camerota kneecapped the essence of modern liberalism. While attempting to attack Trump and his supporters, they agree that people who believe in conspiracies aren’t smart but they do it because it means “you are not responsible for anything” if you blame an external force for your problems. That is the very essence of liberalism today. “You can’t get ahead, the system is rigged against you. Don’t try, the government will protect and take care of you,” is said regularly by Bernie Sanders, Elizabeth Warren, Barack Obama, and countless other liberals. So, without meaning to and attempting to make it an attack on Trump supporters, these liberals destroy one of the major pillars of modern liberalism. This argument is always advanced by people whose own story undercuts it. Obama, Warren, Sanders, and the like all came from modest means to the heights of power and are now very wealthy. How did they beat the “rigged system” if the system is, in fact, rigged? Are they special, better than everyone else? That seems to be what they think. You have to hear it to believe it.